Mr. Holmes came into this world humbly, on the banks of the Savannah River. His mother and father took cane poles to the river to catch fish, and to their great surprise they came back with their new son William. From this amazing beginning, his life has been a journey of service in the best sense of the word. He has given service to his country, service to his family, service to his community as mayor of Allendale for 20 years, and service to his ministry. Last but not least he serves as a living, breathing testament to South Carolina residents that a deadly disease can be conquered if it is discovered early and treated properly. Mr. Holmes served in the United States Air Force as a young man. It was an eventful eight years that took him to Texas, England, France, Arizona, Thailand, and then back to Texas. By the time he returned to Allendale, he was a man of the world. 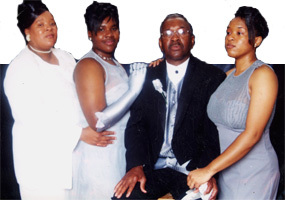 By June of 1997, Mr. Holmes was many years into his second career as an engineer with Westinghouse Savannah River Company when his doctor recommended that he have a routine, precautionary PSA blood test for prostate cancer. Mr. Holmes was 56 years old at the time and had never before had the PSA test. The chance of having prostate cancer increases rapidly after age 50. Prostate cancer occurs about 60% more often in African-American men than in white American men. Mr. Holmes’ PSA test results came back at a dangerously high level — six times higher than normal. This news naturally alarmed Mr. Holmes and his family, but the doctor said he would have to have further tests to know for sure if he really had prostate cancer. It would take two or three weeks to get the results from the additional tests, called biopsies. At his next appointment, the doctor told Mr. Holmes and his wife Diane that Mr. Holmes did in fact have prostate cancer. Mrs. Holmes had always associated the word cancer with a death sentence, and as a result she passed out when she heard the news. “I found myself in the position of consoling and counseling Diane!” says Mr. Holmes. Mr. Holmes replied, “It’s good because two out of six is not bad at all. That means the cancer is not wide spread.” From that day on he looked for the positive side in all his medical news. He remained upbeat throughout his treatment. He attributed his strength and positive outlook to his faith. A team of doctors was assigned to treat Mr. Holmes’ cancer. They tended to agree with his optimistic outlook that the cancer had not spread, but told him that months of treatment would be required to be sure. It was an anxious time for Mr. Holmes and his family. The treatments caused him discomforts of many kinds, but he continued to work until the last two weeks of treatment. As of March 2005 Mr. Holmes has been free of the cancer for over eight years. This means that his cancer is considered in remission and that the treatment was successful. Mr. Holmes now walks two to three miles every day. He has changed his diet, too. He now eats no red meat, white rice, or sweets and has eliminated caffeine. He eats lots of salad, and has oatmeal or shredded wheat for breakfast. He used to smoke a pipe until 15 years ago. Mr. Holmes’ wife and daughters were a great source of support during his treatment. Since he retired in 2002, Mr. Holmes has taught high school, done some consulting work, and continues to do the weekly radio ministry on the Allendale station for the Church of Christ. He also writes a biblical article for the Allendale Sun. Mr. Holmes has a message for all men who have not had prostate screening. “Go get the PSA test. Prostate cancer is not a death sentence and can be stopped. Do not put this off.” Doctors are now recommending that black males be tested at age 40 and the general population at 50. See the Cancer section in South Carolina's Biggest Health Problems for more information about cancer. This site has information about treatment, prevention, genetics, and causes, screening, and much more. Click on What You Need To Know About Prostate Cancer for information about detection, symptoms, diagnosis, and treatment. This Web site explains what prostate cancer is and provides information to help you decide if and when to get tested for it. PSA: What does the test result mean? This public resource on clinical lab testing explains how the PSA test is used, why and when it is ordered, and what the results mean.